100 Degree Hockey - Texas Stars Hockey News: With Meech Signing and Dallas Getting Healthy, Who Goes Where? With Meech Signing and Dallas Getting Healthy, Who Goes Where? Time to follow the dominoes once again. This time, they are moving in a more pleasing direction for Dallas and Texas fans. Last time the dominoes fell it was in the form of injuries to Trevor Daley, Stephane Robidas, Sergei Gonchar, Aaron Rome, Jyrki Jokipakka and Patrik Nemeth. That created some instabilities on the blue lines across the Dallas organization to put it mildly. Last night on Long Island, Daley and Gonchar both suited up for Dallas. Meanwhile, Texas has signed former NHL defenseman Derek Meech to an AHL contract. Where does that leave the defensive depth across the organization? Let's assume that with Rome and Robidas still injured, Dallas assigns Cameron Gaunce. Assuming he passes through waivers, which is a hefty assumption, he will return to Cedar Park. With Meech added, the Stars would feature nine healthy defensemen: Fortunus, Jokipakka, Wrenn, Oleksiak, Labrie, Button, Sinkewich, Gaunce, and Meech. My feeling on what happens has a few dependencies. Derek Meech played 23 games on his KHL contract before leaving the team due to health concerns. He must be over those concerns now, having signed a new contract, but I don't completely expect him to be ready to play this weekend. At the least, Russ Sinkewich will probably be released from his contract if Gaunce is assigned. Afterwards, when Meech is ready for game action, either Labrie or Button will head back to Idaho. 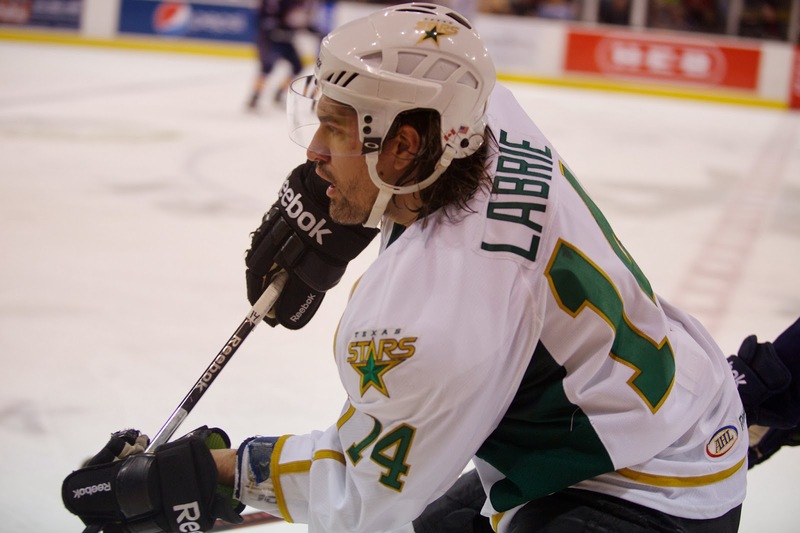 My thought is that Labrie will be the one sent down. The Stars still have a few days before their next game, Friday against Abbotsford. They have some time to make these decisions.